This is my Toklo 15mm Roasted hazelnut review. I'm writing this based on me installing 750 square feet of this in a home over terrazo floors. This is about as thick as laminate comes. To give a comparison, 25MM is 1 inch. There may be some laminate flooring on the market that is thicker, but I have not seen any yet. All four sides are beveled which appears to look more like real hardwood flooring. From AC1 to AC5 this Toklo had a AC4 rating, AC5 is the most durable. This particular laminate was ordered online by my client and had it delivered to her home. The cost is listed at 1.79 per square foot. With the cost of shipping to her home, the square foot price was 2.35 per square foot. It would be hard to find a product for this cost at your local flooring retailer. 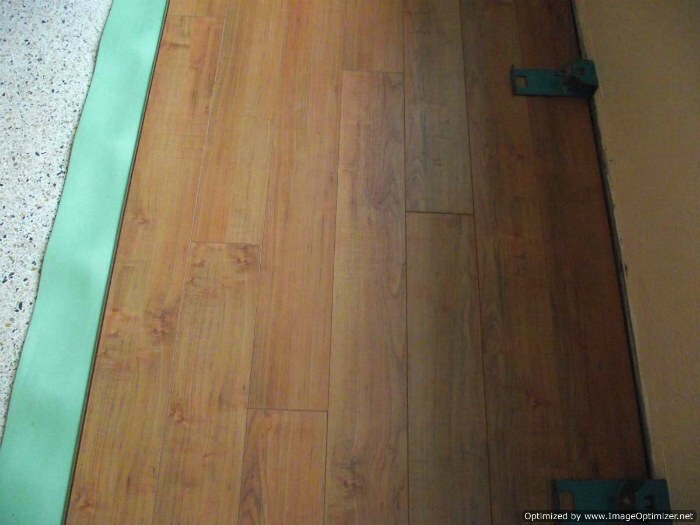 I was impressed with the quality of this Toklo Roasted Hazelnut laminate flooring as an installer. The locking system is called the drop and lock. This system works by connecting the long side first, and then as you push the plank down flat the end overlaps the joining plank and locks. Although you don't need to tap the planks together with this locking system, I did find that I had to use my tapping block at times to get the side joints in tight. This is due to the close tolerance of the machining when manufactured. 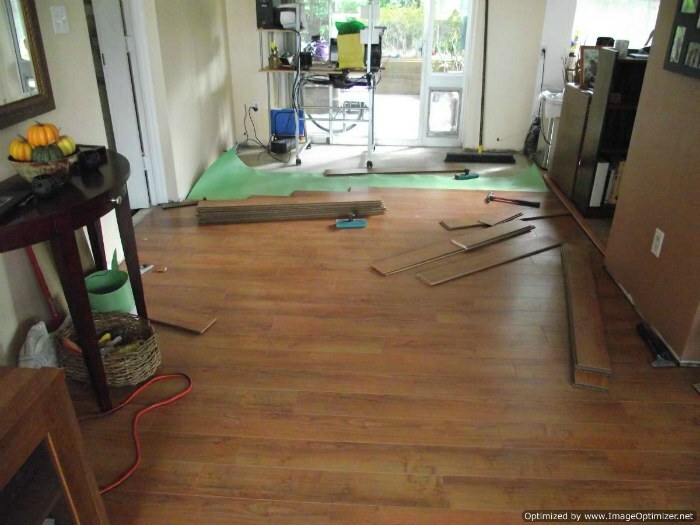 The main thing to consider is where the 15mm laminate will end. 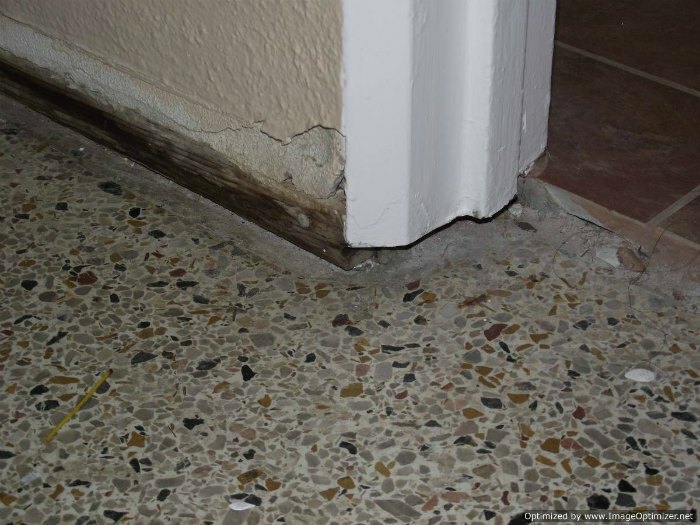 If the laminate ends at ceramic tile, the tile may not be the same heigth as the laminate. Most often the tile will be lower. In this case you will have to modify the transition strip that bridges over to two floors. It may create a small step, although not too high. When I installed this Toklo 15mm laminate, my client had the tile installed first. She made sure that the tile ended up being the same heigth as the 15mm laminate would be. Here I am in the process of installing the laminate. You can see how working around furniture can be done, you just install some flooring and then move the furniture onto it. On this particular installation the door jambs were made of metal. Undercutting them worked with my undercut saw. I used the carbide blade that I normally use for cutting wood door jambs. It worked pretty good although it didn't leave my blade in very good shape.